I'm done digging into the Air Force Physical Fitness Test (PFT) scoring charts. While people have a great many opinions on the test and how to make it better, here is my one recommendation. Get rid of the aging penalty on those approaching retirement eligibility! The PFT singles out this group of individuals (30-39 years of age), and while it giveth a sliver of aging benefit with the left hand, it taketh it away with the right hand. As the charts make perfectly clear, a 39 year old in this group is expected to run the same as an 18 year old. Some will note that the 39 year old has an extra 24 seconds to keep from failing the running component of the test (giving with the left hand). That is true, but what should also be noted, is that if a 39 year old uses that extra 24 seconds to pass the running component, they are penalized point wise. 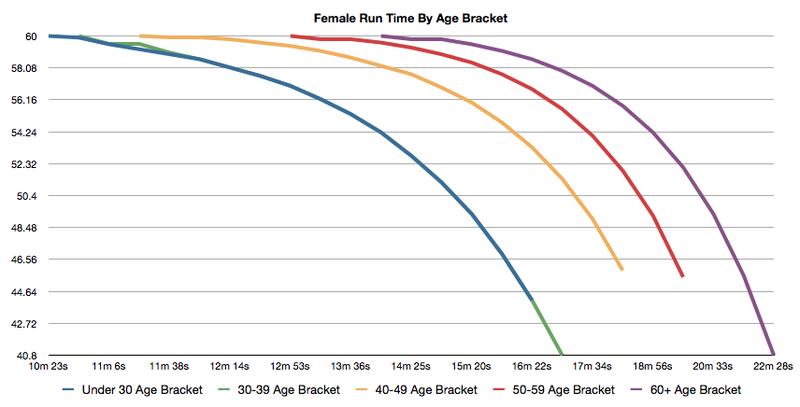 All other age brackets are not penalized for passing the running component in the slowest allowable run time. The 39 year old, however, will pass the running component, but then they must make up an entire three points on other areas of the test. For example, by adding 23 additional push-ups, to crawl back to the same point level as individuals from all other age groups that also run in the slowest allowable time. So while it looks at first glance like the 39 year old gets an aging benefit for run time, the right hand quickly takes it away. I am operating under the assumption, of course, that aging is somewhat constant. If there is evidence that a 39 year old's ability to run isn't greatly affected after 21 years of aging, or that the amount it is affected isn't as much as the person who ages from 39 to 40 years of age, then I'll retract my recommendation. But I don't think that is the case, and I think aging can be factored much better into the test. Beyond what my body tells me through aging aches and pains, a quick non-academic Google search finds several sources that indicate that our lungs start aging at 20 years of age, with a corresponding decrease in the ability of the lungs to place oxygen into the blood stream. Bones start to age at 30-35 and joint issues begin to be experienced. Muscles start to age at 30 years of age, and while the muscle fitness component of the PFT takes this into account, it does not take this into account for the running component that comprises 60% of an individual's score. For those who might be tempted to think this test discriminates against a certain age group, it does rightly or wrongly. Whatever your view on the morality, such singling out is perfectly legal to do in the United States, as long as those singled out are not yet forty years old. Congress' law, designed to prevent companies from kicking out employees just prior to earning a pension, does not apply to the crusty 39 year old. This hasn't stopped at least one officer, Lt Col Chris Cote, from filing a complaint about the walk test portion of the PFT being discriminatory against older individuals. Says Lt Col Cote, “And it’s not just me, the 56-year-old... If you’re 30, the 20-year-old’s got a better deal than you.” While I've never done the walk test, the math clearly shows he is absolutely correct that age is directly penalized in the walk test. The formula is calculated (with a higher number equating to more points) as: 132.853 – 0.0769(Weight) – 0.3877(Age) + 6.315(Gender) – 3.2649(Time) – 0.1565(HR). If a person's weight, walk time, and heart rate stay the same, then they get penalized each year they age. That being said, apparently heart rate is supposed to decrease as a person ages (I've heard one heart beat per minute per year, and I've read 5-7 beats per minute per decade). From the article above, the Lt Col recognizes this but says the formula doesn't account for this appropriately. An individual at age 38 that walks the test in X minutes, and has a heart rate of Y will get a VO2 score. That VO2 score will then equate to a running component score to be factored into their final PFT score. If a year later they walk the test in the same time, and have the same heart rate, they will get a lower VO2 score simply for aging one year, and it will translate to a lower component score and a lower score on the PFT. The walk test would appear then to uniformly penalize aging. In actuality, however, it penalizes those under forty years of age more because the VO2 scores of those forty years and older is converted into a higher score on a different chart. The bias against those under 40 years of age is crystal clear in the walk test portion of the test, as well. Whether one thinks the test is easy, or difficult, scores excellent or fails, the fact of the matter is this test has a strong bias against those in the 30-39 age bracket. 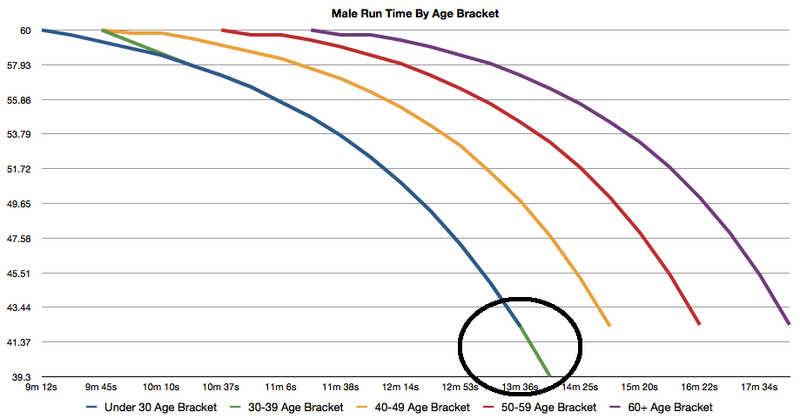 The other day I dug into the Air Force's Physical Fitness Test (PFT), and discovered that the test is the most difficult (relative to age) for members in the 30-39 year age bracket, particularly with the run. 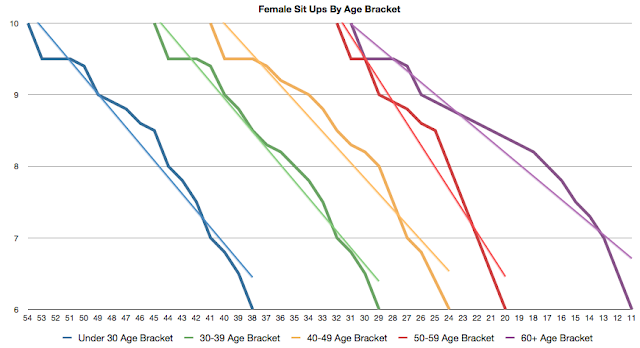 So I decided to chart out the numbers of the older PFT, to see if age brackets were treated any differently. The older test differed only slightly from the current test. 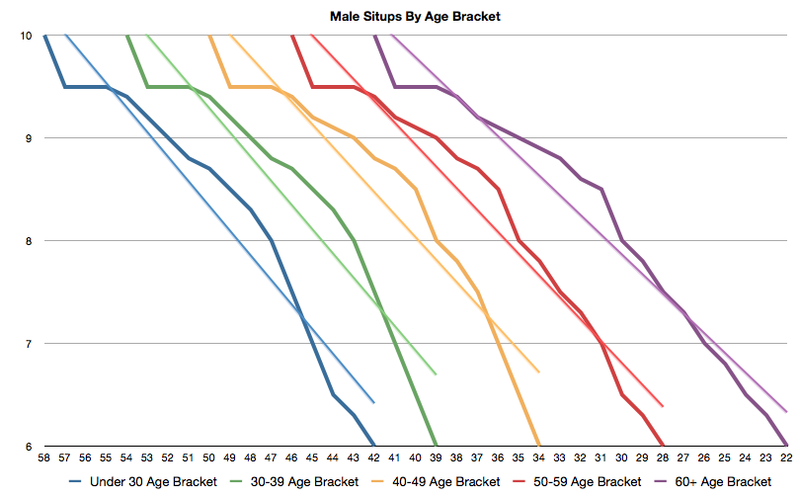 While it had five year age brackets, instead of ten year brackets, those split brackets only applied to push-ups and sit-ups. The old run was scored using ten year age brackets just like the current test. The abdominal circumference measurement was also like the current test, in that the score was the same across all age brackets. The largest difference with the old test was that it weighted the waist measurement with 30% of the total score, and the run counted for only 50%. The test also differed in that there were no minimum component scores - as long as the member was able to get 75 points, they passed the test. The old test charts show the current PFT isn't much different than the older one, at least in terms of the standards required of the 30-39 year group, as opposed to those who are retirement eligible in their forties and on up. The old test push-ups are the exception. There the test evenly distributes benefit for aging, as would be expected if aging was considered to be constant. 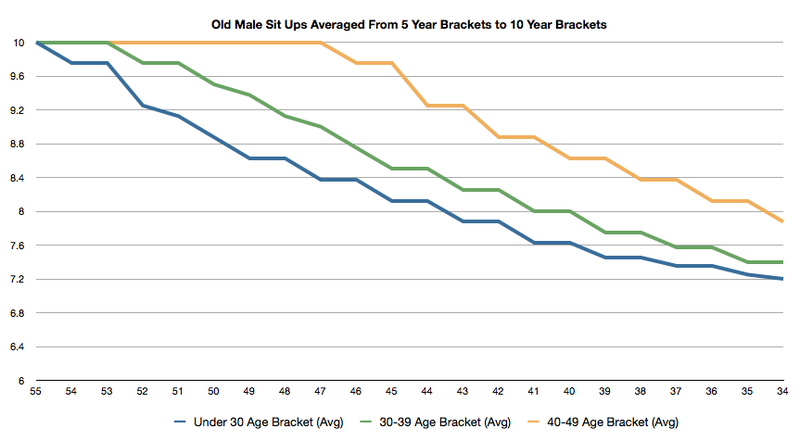 Sit-ups, however, have a slight aging bias against those approaching retirement, and a huge bias in terms of the run. 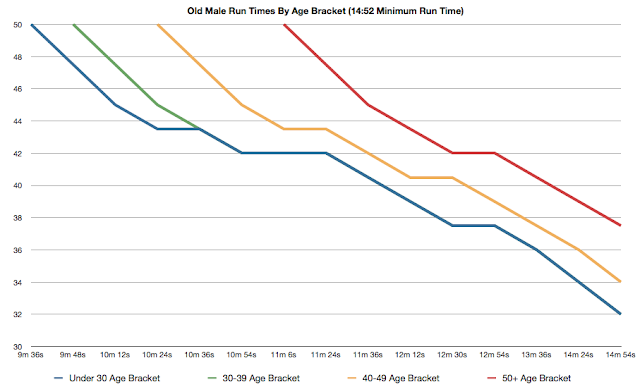 The aging bias against the 30-39 year old group is not something that started with the current PFT scoring system. Is the PFT Harder For Those Coming up on Retirement? It is widely believed within the ranks that the Air Force's relatively recent Physical Fitness Test (PFT), doubling of testing from every year to twice year, and failure policy (booting airmen after four failures within two years) is less about saving money on future health care costs, and more about saving money by reducing the force. As recent military retirement overhaul discussion shows, only seventeen percent of those in the service retire and collect health care benefits. The service is drawing down and has taken some drastic measures to thin the force, including showing the door to 157 majors with fifteen years of service, despite law mandating that officers with less than six years until retirement be normally allowed to continue until retirement. As I age and near retirement eligibility, I have unfortunately found that the PFT is not as easy as it once was. I had assumed since the test had age brackets, my aging would be compensated for in some way and things would continue as long as my lifestyle stayed the same. I have never been on a medical profile, but my body is telling me that something is different. So I decided to dig into the numbers a little bit to see if the only thing changing was my body ache and soreness. We all age and have to fight to stay in shape. I have never enjoyed running and I have consistently only done so when required by the Air Force. Physical fitness was a priority and a vanity in my younger years, but as I've gotten older I've found other things to be more worth my time. In my first four years taking the Air Force PFT, I ran the mile and a half in 9:30, and felt like I was doing little more than jogging. My best time was 8:34. I was twenty-years old. Almost two decades later, I have to train in order to run it in under 14:00. I have noticed that the test has become much harder for me to pass, and I wondered if the scoring system for the test hadn't been engineered to target, like the promotion board that separated the 157 majors referenced above, service members just before they are eligible for retirement. After all, kicking out those service members who have given 75% or more of twenty years of war time service without a pension, makes a lot of sense fiscally. At least in the short term, and on paper. Charting the numbers shows that is likely the case. Those between 30-39 years of age have the most difficult PFT testing standards in the Air Force. 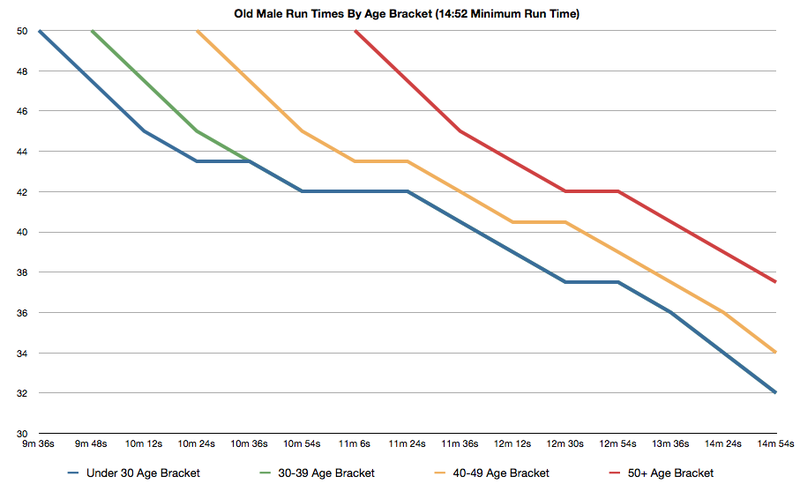 That is the age group approaching a twenty year retirement. Enlisted personnel likely will reach retirement eligibility at age 38, while officers have to punch through to age 42 to earn a pension. The Air Force PFT treats those nearing retirement more harshly, and differently, than it does anybody else serving. I'll explain how I came to this conclusion. 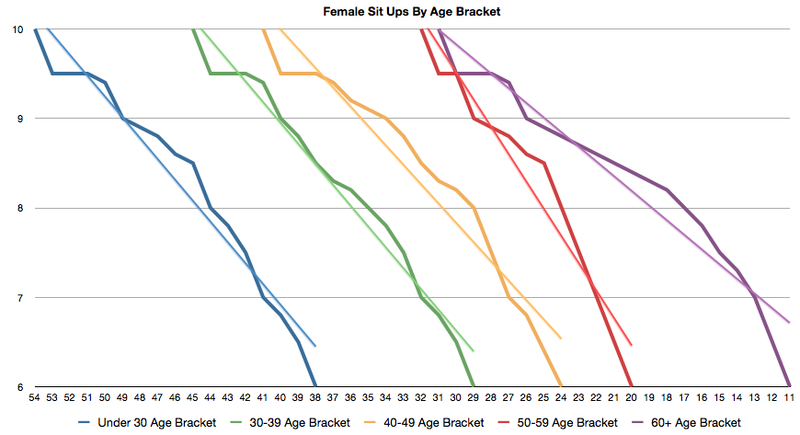 I'll limit my observations to males and the three brackets representing the ages up to a twenty year retirement. This information can be checked using the Air Force PFT scoring charts. In all age brackets, the target abdominal circumference is the same at 37.5 inches. The maximum is also the same at 39 inches, and the score component is the same for all ages. Unlike the other components of the test, service members do not get any leeway for their waist size as they age. This portion of the test, therefore, affects all age brackets equally. Therefore we can dismiss it and turn to the other PFT components. 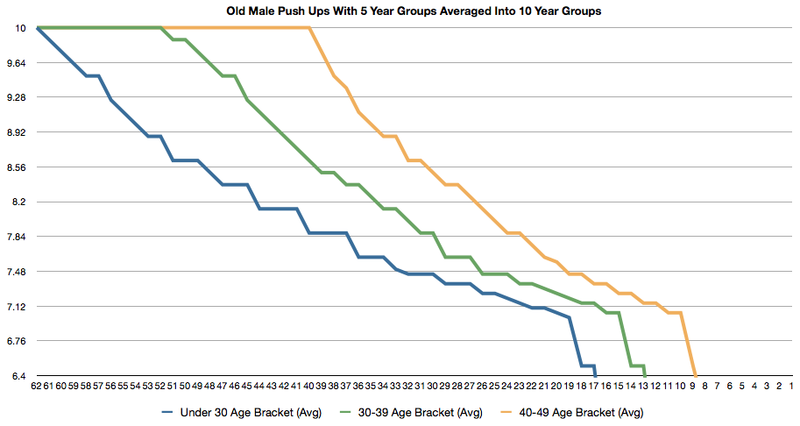 The target number of push-ups for the under 30 crowd is 44 (the minimum required to pass the test is 33). For those 30-39, it is 36 (the minimum is 27). 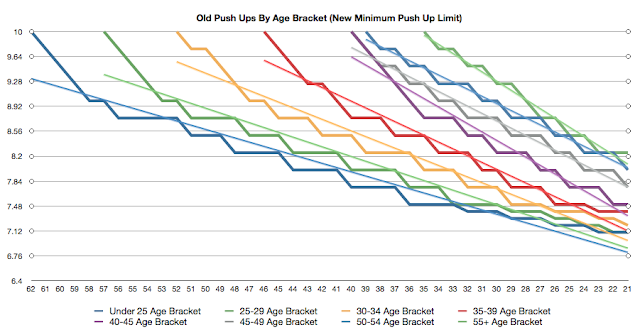 And for those retirement eligible at over 40 years of age, it is 29 push-ups (the minimum is 21). The target number of sit-ups for the under 30 crowd is 46 (the minimum is 42). For those 30-39, it is 42 (the minimum is 39). And for those retirement eligible at over 40 years of age, it is 37 sit-ups (the minimum is 34). The target run time for the under 30 crowd is 13:14 (the slowest it can be run is 13:36). For those 30-39, it is also 13:14 (the slowest it can be run is 14:00). And for those retirement eligible at over 40 years of age, it is 14:25 (and the slowest they can run it and still pass is 14:52). If a service member scores more than the minimum required for a component, they get more points. The number of points, however, differs by age bracket and also gives an indication of the age correlation to the test. Somebody in the under 30 crowd that does one more push-up than the minimum, earns an additional .3 points. Somebody 30-39 will also earn .3 additional points. Somebody 40 years old will, however, earn .5 points. 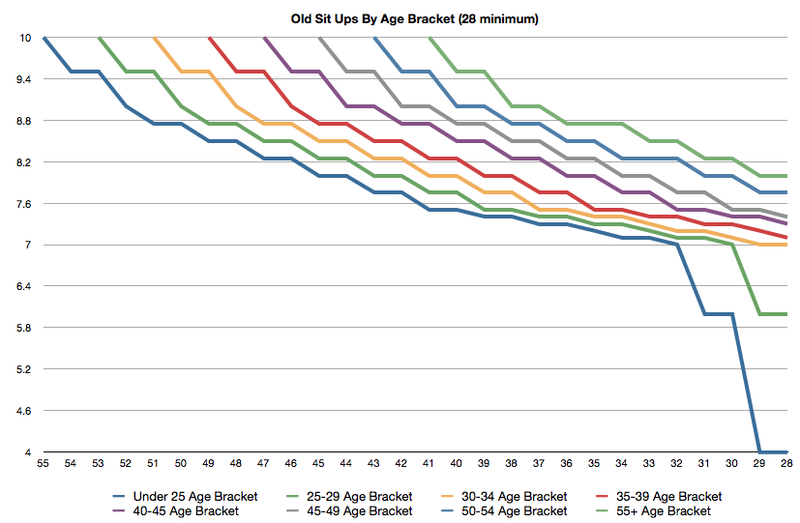 Somebody in the under 30 crowd that does one more sit-up than the minimum, earns an additional .3 points. Somebody 30-39 will also earn .5 additional points. Somebody 40 years old will also earn .5 points. Somebody in the under 30 crowd that shaves 22 seconds off the maximum run time, earns an additional 2.6 points. Somebody 30-39 that shaves 24 seconds off the maximum run time, earns an additional 3.0 points. Somebody 40 years old will, if they shave 27 seconds off the maximum run time, earn and additional 2.9 points. 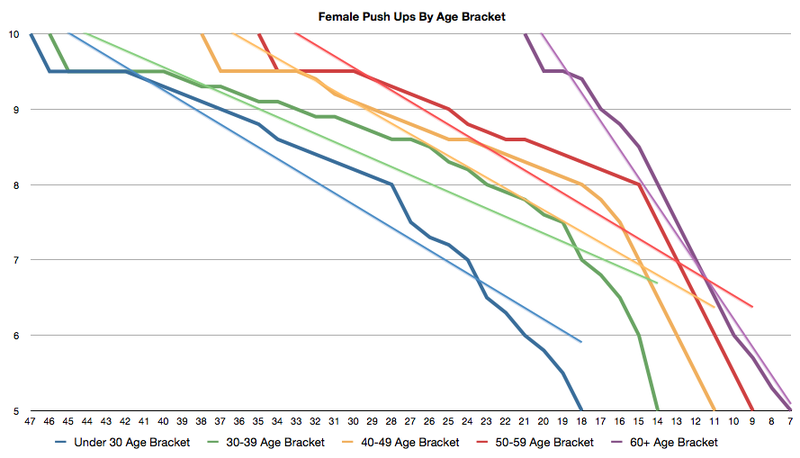 Somebody in the under 30 crowd must do 67 push-ups for the full ten points. Somebody 30-39 will need to do 57 push-ups for the full ten points. 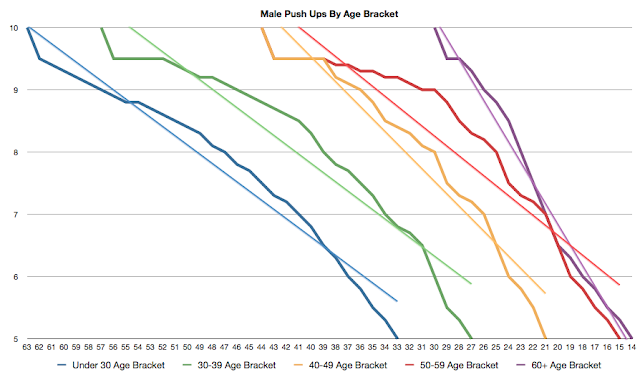 Somebody 40 years old will require 44 push-ups for the full ten points. 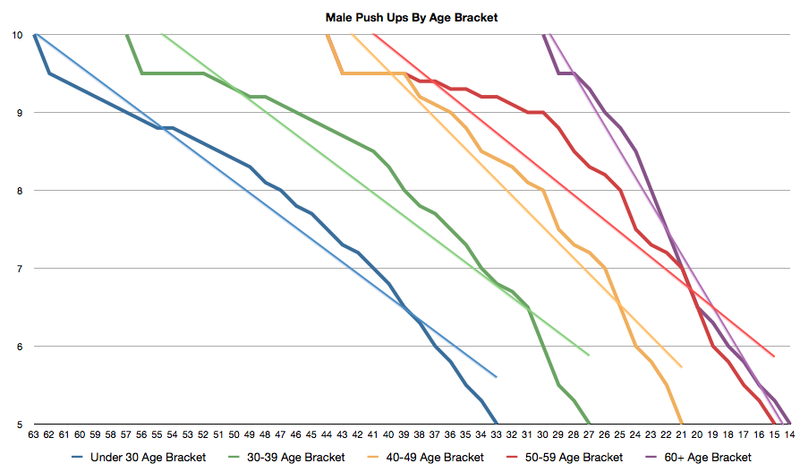 Somebody in the under 30 crowd must do 58 sit-ups for the full ten points. Somebody 30-39 will need to do 54 sit-ups for the full ten points. Somebody 40 years old will require 50 sit-ups for the full ten points. Somebody in the under 30 crowd must run in 9:12 for the full sixty points. Somebody 30-39 will need to run 9:34 for the full sixty points. Somebody 40 years old will need to run 9:45 for the full sixty points. The real question is how much effort must be put in to score the most points? 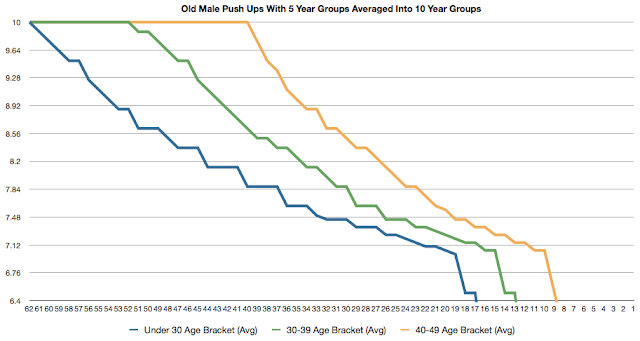 How much is gained by each additional push-up, sit-up, or second of run time? This is where we can really see if the test gets any easier to pass as our bodies age. Note: for a better look at the charts, click them. From the charts above, we see that the "close to retirement" group, between 30 and 39 years old, gets a bit of a break on push-ups and sit-ups, not unlike retirement eligible people in their forties. The trend line shows, however, that those nearing retirement eligibility require the same level of pain for the same corresponding amount of score gain as the eighteen year old, at least when it comes to push ups. Less pain is required for more gain for those who are retirement eligible in their forties. As to sit-ups, the pain-to-gain ratio is even across all age brackets. It appears taken together, the muscular fitness section is just slightly harder for those in the 30-39 group, but not by much. But these two areas are only 20% of the score required. The mile and half run, on the other hand, comprises 60% of that score and it's in that chart that my suspicions were confirmed. The group close to retirement age, between 30-39, gets an extra 24 seconds to keep from failing the run event, while those of retirement age in their forties get a whopping 52 extra seconds of run time. Not only that, but those in their forties also get significantly more gain for running faster, while a crusty thirty-nine year old gets absolutely nothing beyond what the eighteen year old gets. Age is barely considered at all, when it comes to run, for the 30-39 year old group approaching retirement unlike every other age bracket. It's almost as though they haven't aged at all since they graduated high school. 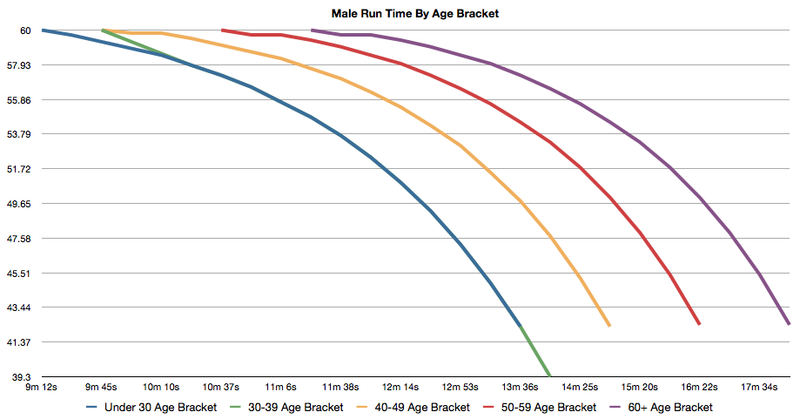 In addition, the 30-39 year bracket gets penalized for "just making the run time," unlike every other male age bracket. The same is true for the female age brackets, with the exception of 60+ year old women who serve in the Air Force (if there are any). 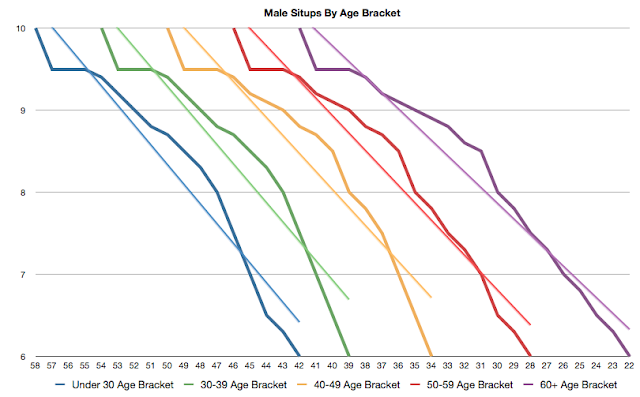 This means the 30-39 year old group that just barely passes the running portion, must make up at least three extra points to be treated as the other brackets. To get these three extra points, they must do an extra 23 push-ups, or an extra 13 sit-ups, or have a two inch smaller waist measurement to get the same points all other age brackets get for just barely passing the running portion. This point clearly demonstrates that the Air Force PFT singles out those approaching retirement, and gives them the most difficult physical fitness test in the service. Those who are coming close to retirement eligibility have a relatively harder Physical Fitness Test than the youngsters who enter the service, and than those in their forties who are eligible to retire. If you want to retire, you have to work harder the closer you get in order to achieve it. It's interesting that those who implemented this new PFT program were likely already past the 30-39 age bracket. 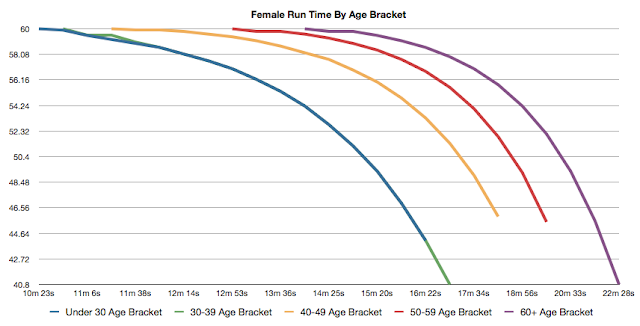 ETA: For those interested in the Female Charts, those approaching retirement have a more difficult push-up standard, and the run standards are similarly biased against those approaching the twenty year service point. Is the Air Force Failing in the Character Department? USAFA cadets who reported engaging in honor code violations rose from 29% with the Class of 1959 to 66% with the Class of 2010. USAFA cadets who tolerated, and did not report, honor violations rose from 5% with the Class of 1959 to 68% with the Class of 2010. Those who reported having respect for the honor code stayed nearly 90% for the fifty years prior to 2007, but from 2007-2010 dropped to 70%. Now, another barometer has delivered more bad news. The Defining Issues Test, a scientific yardstick for measuring moral thinking, has found no significant difference in the highest level of moral reasoning between academy seniors and seniors at other colleges and universities. It's also found that one in four members of the Class of 2010 regressed to lower levels of ethical decision-making while at the academy, despite 60 hours of honor and character development training. All at an institution where taxpayers pay more than $400,000 per graduate to create "leaders of character." From my own personal experience, I think this data makes sense and is just the tip of the iceberg. This is a much larger cultural issue. The article shows that similar results were found in all of the service academies. In my years of service it has become painfully clear to me that the higher standard of ethical conduct expected from Air Force officers is a myth. Nobody expects particularly ethical conduct, and such conduct is not role modeled or rewarded (in fact in the rare chance it's encountered, it is often punished). Instead, what is expected is the perception of ethical conduct. That perception is achieved through proclamations and recruiting posters and speeches, and through the inertia of social and media expectations. I would guess that our young zoomies at the Air Force Academy learn that lesson quickly. Our Air Force has become a political landscape where we say one thing, and do another, not unlike the standard issue American politician. The air service is no longer a cut above. It's no longer a profession populated by the courageous who are willing to sacrifice for their country (outside of rarely dangerous combat missions that are touted as being little less than the Normandy invasion). Instead, the Air Force has become a place where airmen learn to "play the game." Service in the Air Force has become a game. 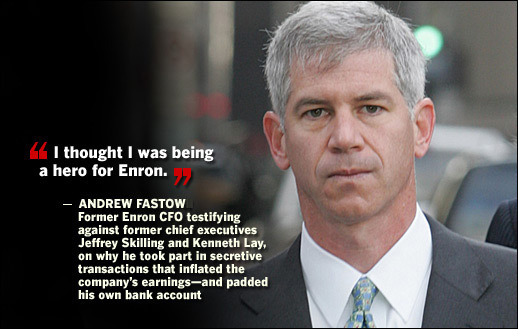 One that Andy Fastow could have coached. Fred Malmstrom has tapped into something very important, in my opinion. The United States Air Force is suffering an enormous and very dangerous ethical crisis. If I were king for a day, I would study the differences between military officers and the non-commissioned officer corps. I have no data to back it up, but in my experience the more courageous and ethical individuals are not the officers with the educations, but rather our NCOs. I love the old black and white films. It's interesting to note the difference in how things are said and presented when watching the outstanding classic, Twelve O' Clock High, with Gregory Peck as compared to that same time period portrayed through the masterpiece series, Band of Brothers. Nothing beats the real thing though. Here is actual American government footage from that time period, narrated by General Eisenhower's brother Milton, who was the head of the War Relocation Authority (WRA) that worked with the United States military to force American citizens into concentration camps in the desert. It's an amazing look at recent American history, and there are indications that the military may again be ordered to focus energies on American citizens within our borders, rather than solely on foreign forces. Sadly today I had to put down my cat, Mando. Short for "Air Commando." He was just a kitten with his eyes barely opened when I answered the free kittens ad upon my arrival to Fort Walton, Florida. He was my best friend in the last of my single days, and he converted my wife from her dog-centric upbringing into a cat person. Mando lived with my wife all through her law school years and perched himself on her piles of law papers. My wife labored through law school despite Mando continually convincing her it was best to just take a nap for a little while. He was black, he had all his claws up until his death, yet he was incredibly gentle. He was great around other animals and people. Mando was a great living being. We had hoped he would join us at our retirement home, and climb trees and bask in the sunshine. He was only ten years old when he died today. 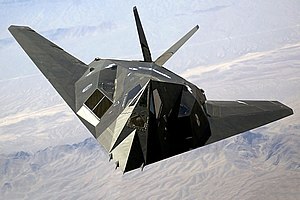 The Air Force is drawing down as the American financial crisis looms, and as wars appear to be coming to something resembling an end. I've blogged previously about the effects this effort has had on some officers, offered voluntary separation (some who applied and were denied), who were then booted at the fifteen year point. Some of the 157 majors, kicked out five years shy of a hard earned retirement, are challenging that maneuver and have pursued legal action against the Air Force. I was skeptical of their claim initially. After reading more about the language Congress used when drafting the law, ie that officers with less than six years should "normally" be continued until retirement, I changed my mind. I think they have a case and it will be interesting to see how that plays out. In the meantime, Montana Representative Denny Rehberg has championed their cause, and is pushing for legislation to correct the situation. The Keep America's Promises Act appears to be getting some support. Perhaps these 157 officers won't be scrapped to the boneyard after their long service after all. Recent promotion boards show the service is using other ways to thin the force. A once 96-ish percent promotion rate to Major has now dropped by roughly 30 percent. Men and women who have served nearly ten years, much in or supporting combat operations, are getting the message that their futures in the Air Force are anything but certain. Meanwhile, the Air Force continues to kick out individuals who fail the physical fitness test, and the service is steadily making the test harder by reducing "safety" requirements once associated with testing in too hot, or too cold conditions. The sacking of civilians to administer the test, in my opinion, will result in more PT failures due to the increased number of testers with their own moving target subjective standards. Despite the GAO office's report that the Air Force has more whistle blower complaints than any other service, I'm guessing policies will be put into place to rid the service of those with "paperwork" (which every whistle blower likely earns for their troubles). As I understand it, that is the crux of the legal argument being made by the 157 majors mothballed at fifteen years, that Congress essentially meant that officers without negative records should normally be continued until retirement. I wouldn't be shocked to see this policy come out in some form or fashion. The take away is this... Those of us in the air service have no job security. Despite your best efforts, you may be shown the door rightly or wrongly. This isn't necessarily a bad thing. Like soldiers who consider themselves already dead, in order to clear the fear when rushing enemy troops, we should do the same with our career mentality. Consider your career already dead, and do the right thing for the nation while you serve. Double your efforts to guard your integrity and be better than your peers by actually focusing on something greater than your career. While others concentrate on the new standards and magic formula for getting promoted in these uncertain times, we have an opportunity to consider doing something great for our troubled nation and its ability to defend America. And don't listen to the inferiors, who delude themselves by thinking that their ladder assension skills make them good military officers, when they tell you, "Pick your battles, pick your battles, pick your battles." They don't battle, that's why their precious careers are so unscathed with war wounds. As a fellow officer recently told me, "The military didn't give me a sword to fall on, rather to fight with and I'm about to swing away." The nation hired us to display courage and to fight, not to manicure our careers and avoid the fray. There are many battles that need to be fought, and too few showing the character to fight them. There is no better time than now to do the right thing. After all, what do you really have to lose?